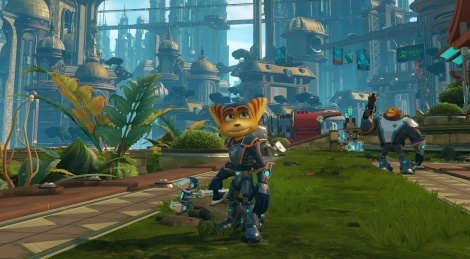 14 years after its original release on PS2, Ratchet & Clank is back alongside a movie and we were able to complete the game just in time for the end of the embargo. As usal, you will find the translation of our verdict and the +/- section inside and a lot of videos captured during the first two hours of the game. For the full review, head over to the French side. Because we wouldn't want you to feel left out, we'll be live tonight at 10 CEST to tell you precisely why we enjoyed our time with the famous duo. If you have questions regarding the game, make sure to be on time! 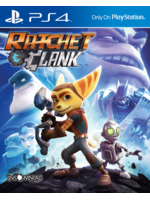 Given its price tag, one might think that Ratchet & Clank is just a minor game in which very little effort was put to be ready for the release of the movie, but it clearly is not the case. Even though some sequences of the original game have disappeared to match the movie script, there is still plenty of things to enjoy in this remake. Those who have already completed the original game won't be surprised much of course, but the graphics are so great that they probably won't want to miss a chance to rediscover their favorite PS2 game in a new light. There was maybe a pinch of nostalgia in the way we enjoyed our time with the game, but there was also definitely some good old fun and that's exactly why we can recommend it. After several episodes which were trying different things to modify the original formula, Insomniac Games have managed to bring back the series to life by going back to its very roots. Let's now hope the movie will get enough attention so the next episodes deserve the same treatment soon. how long did it take to beat the main campaign? i hear the original was 10 hour's or so? 14 years... I feel old. This looks pretty great. I've always resented R&C for taking the place of Jak, but it's time to let go. No idea really, there is no counter in the game or on the PS4 itself. I'd say at least 8 hours or so, more if you look for everything (which can be done in one playthrough easily). Then if you want to max out all your weapons and get the more powerful versions of each, you must play the game again in challenge mode. Great review, cant wait! Can you be more specific about what kind of bugs you encountered? Apparently I was the only French reviewer with problems. First ne I had, I ended up having the black bars (those you normally only have at the top and at the bottom of the screen during cutscenes) in gameplay sequences. Had to restart the game to go back to normal. Second one, I almost lost my whole game. An optional mission I had completed appeared as uncomplete in the list of locations. I went back there, but since it was an enclosed location (a warship) I couldn't leave anymore because there was no prompt allowing me to take my shuttle (as it was only supposed to be required because of the self-destruct sequence that happened at the end of the mission). The problem is that since I had already completed the mission, the script starting the countdown wouldn't start. Thankfully, my save on the cloud was older. I don't get why there is only one save slot, it's stupid. Ok, thanks. Hopefully things like that get patched before next week when the game releases in my county. This and dark souls 3 have really annoying release schedules btw. Played this growing up, now I will play it again with my five year old son! Looking forward to it. Without game time being tracked and with the game having side activities and collectibles. I imagine its hard to say how long base level storyline is without stringently sticking to it and sitting with a stop watch next to you. Some reviewers might have done everything, other reviewers might have just done the story and others will have done anything in between. The expression "time flies when you're having fun" is relevent too i guess. Frame rate : 60.000 fps"
Should be 59.94 to be correct as far as I know. I've done story, optional missions, gold bolts and most cards and I didn't play for 10 hours. Game looks great, dem graphics ! the reviews are in, congrats insomniac. they do make great games. Hmm that's strange. First I've heard of this. Even YouTube videos with entire play throughs are totaling over 10 hours.